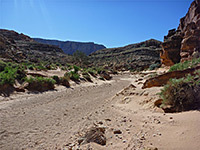 Tanner Wash is a long but usually dry Colorado River tributary that runs for many miles next to US 89 beneath the towering Echo Cliffs, which form the eastern boundary of the wide, flat plain that surrounds the north end of the Grand Canyon. The wash enters its own little canyon 6 miles from the river - quite scenic though not generally narrow, the drainage is enclosed by crumbling, multi-layered, black-stained cliffs typical of this region, and deepens gradually in small steps between long level sections. The best part is about half way along, where the wash tightens and cuts through especially thin rock layers. 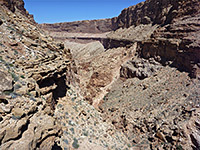 Then, for a third of a mile (500 meters), the canyon walls and floor are formed of hundreds of tilted, stepped strata which create very photogenic passages, interspersed with pools and dryfalls. 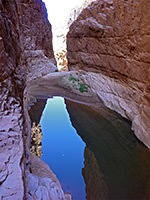 The wash crosses from the east side to the west side of US 89 2.5 miles south of the junction with ALT US 89 at Bitter Springs, a small Navajo village near which the canyon proper begins. One good place to park is on a short side track beside the main road immediately west of the junction, next to a concrete foundation from a former residence. 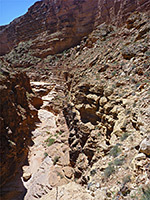 The canyon is visible in the distance and is reached by climbing over a fence, walking westwards across a sandy area and into a little drainage. This leads north and soon meets a slightly larger ravine, which in turn joins the main canyon, 0.7 miles from the parking place. 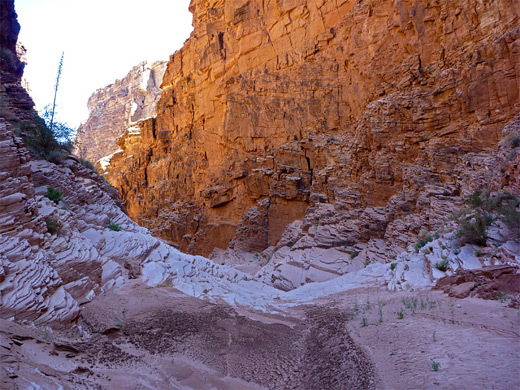 Except the lowest section which is part of Grand Canyon National Park, all of Tanner Wash lies on land of the Navajo Reservation so officially a Navajo hiking permit is required, and this may be purchased from the ranger station at Cameron. 18 views of Tanner Wash.
Topo map of Tanner Wash. 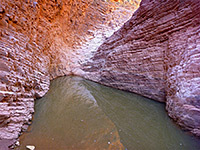 The entrance ravine meets Tanner Wash, which is still shallow, near the junction with several other minor tributaries, all of which make the main canyon deepen noticeably just downstream. Kaibab limestone cliffs begin to rise and from here on there are no easy routes out, though the walls take a while to attain any great height and the character of the wash does not change much for about 3 miles, almost 90 minutes walking, at which point the canyon rim is about 300 feet above the streambed. 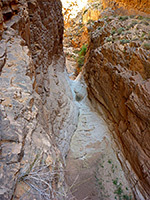 There is one main side ravine, on the east after 1.8 miles, plus several lesser tributaries, while the canyon contains a few deep potholes and some short, narrow, slot-like channels through exposed rocks, but for the majority of the distance the drainage is characterized by long, straight passages, a flat, boulder-strewn streambed and piles of fallen rubble at each side. A big dryfall after about 2.5 miles is followed by a more ledgy section, through red and brown rocks, where the floor deepens a little more steadily via many little steps. The drainage curves through a couple of tight bends, creating cool, shady areas in morning and late afternoon. The appearance changes when the wash enters the Coconino sandstone layer with its many thin strata, since then the canyon narrows quite a lot and becomes very pretty as the light catches the broken edges of countless, slightly differently aligned rocks. It also deepens much more via a series of staircase-like steps, pouroffs and smooth slides which despite being sometimes quite steep are all easily free climbable though in wet weather the drops may be into muddy pools up to 6 feet deep. This section ends with a final, sheer dryfall of 50 feet beneath which is a large pool and a dripping spring/seep at one side. There is no way to climb down here but the obstacle can, with some effort, be bypassed on the south side by firstly walking back to the start of the Coconino layer then traversing at this level above the canyon for over half a mile, following a faint path across a narrow bench at the foot of steep, cactus- and boulder-covered hillsides, eventually reaching a height of several hundred feet above the streamway, and finally coming back down a long, steep and rather unstable rock slide. 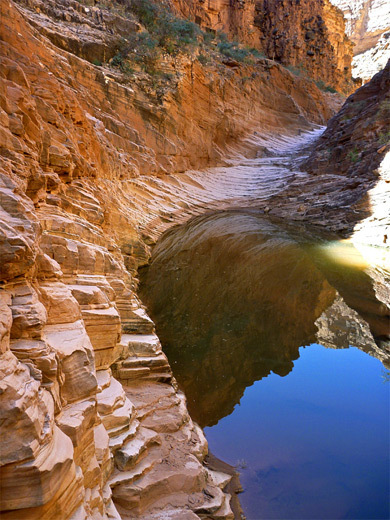 Unless intent on reaching the Colorado, continuing past the big dryfall is not really worth the trouble as apart from a second shorter narrow part just before the river, the remainder of the canyon although deep is wide, V-shaped and not especially interesting.